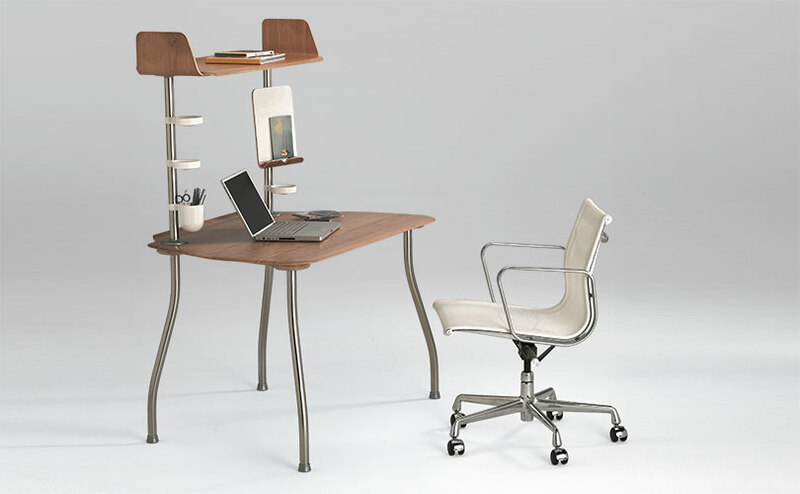 The first product made available in the unplugged collection, Lucy is a compact desk with an overhead shelf and coordinated work tools. It features a work surface constructed with our innovative hollow-body method. Weighing in at just below 40 pounds, Lucy is light and easy to move but strong enough to support 300 pounds and uses less than half the raw materials of a solid wood or particle board top of the same size. Lucy is a spacious and practical workstation with a complete set of organizational tools that includes a dry erase tablet for notes and reference materials, a pencil cup and 3 shallow dishes for paperclips and other small items. All wood components have a top veneer of satin smooth natural cherry, lending the design a warm aesthetic suited to a home office, children’s room, or retail space.